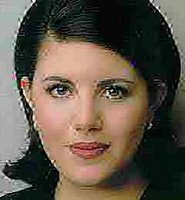 Monica Lewinsky has decided to take on Hillary Clinton once again. The vixen whose misbehaviour sparked impeachment proceedings against Hillary's husband, then-President Slick Willie Clinton, has declared her intentions to run for the United States Senate from New York against Mrs. Clinton, who is seeking re-election. "I was better for Bill than she was," Ms. Lewinsky said in her announcement. "I'm bound to be a lot better for New York than she has been. Let's face it, I've got it and she doesn't. I'm the best woman for the job." The former Canadian ambassador to the United States, Frank McKenna, admitted this week that his former boss, Prime Minister Paul Martin, lied about conversations he had had with U.S. officials in an effort to fan anti-Americanism and boost Martin's ultimately failed re-election effort. "We all knew what he was doing, but we couldn't stop him," McKenna said. "Personally, I'm glad he's out of there. Next thing you know, he would have been arguing for interspecies marriage." President Bush this week signed a nuclear deal with the Indians. "This is a great moment in American history," the president declared. " 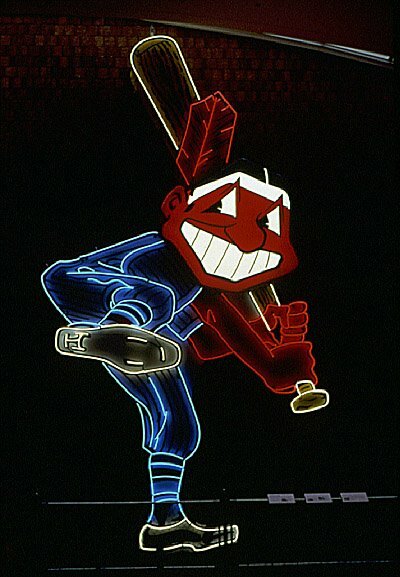 The spokesman for the Indians, Chief Wahoo, called it a momentous occasion. "If we had had this a couple of hundred years ago, we would still be running the country," the chief said. "As it is, I think this deal will benefit not only the Indians, but the Braves, Redskins, Fighting Sioux, Seminoles, Fighting Illini, Red Raiders, Chiefs and Squaws, too." Terrell Owens is still in limbo. Fans at the Schuylkill Haven Institute of Technology rushed the court this week after their team lost to Cressona Redoubt of Arts and Pederasty in an overtime thriller. It was the closest game S.H.I.T. had played all season, losing to C.R.A.P. by just four points. Finally, alleged comic and host on the daying Air America left-wing talk network, Al Franken, has decided he will not run for the Senate from Minnesota. Instead, he will run for President in 2008 on the Democratic ticket. "There's 100 senators that I'd have to share the space with," Franken said. "I, Al Franken, could never condescend to that. I have to the the only one, and there's only one President. So that's where my energies will be going as soon as Air America officially goes into the tank." Watch out. It comes in a threatening kind of e-mail, so beware. Next Thursday, it will be right here! Hillary Clinton, the fascist presidential wannabe, doesn't like the Dubai Ports World deal. Hillary Clinton is to introduce legislation in the US which would block the take-over of P&O by Dubai Ports World. The US senator for New York claims the deal poses a threat to national security because it would place operations at six major US ports under the control of the government of the United Arab Emirates, which owns Dubai Ports World. "Our port security is too important to place in the hands of foreign governments," said Mrs Clinton. On the other hand, her erstwhile husband, former president Slick Willie Clinton, is O.K. with the deal. Bill Clinton has nothing but kind words for the United Arab Emirates, even as his wife leads the charge to keep a Dubai-owned company from operating terminals at ports in the United States. "I have a very high opinion of UAE, and Dubai in particular. They're trying to build a new Middle East. They really are," Mr. Clinton said Tuesday. I think these two need to talk. Unless, of course, it's the classic Clintonian strategy of having all your bases covered and being all things to all people -- when in reality, they're nothing but pro-Clintons and the hell with everyone else. John Conyers is a Democratic congressman from Michigan and a noted member of the Far, Far Left Brigade. In fact, Conyers is a leader of the pack that wants to impeach President Bush. But Mr. Conyers' glass house appears to be somewhat unstable. Two former aides to Rep. John Conyers Jr., Michigan Democrat, have charged that he repeatedly violated House ethics rules, the Hill newspaper reports. Deanna Maher, a former deputy chief of staff in Mr. Conyers' Detroit office, and Sydney Rooks, a former legal counsel in that office, shared numerous letters, memorandums and copies of e-mails, handwritten notes and expense reports with the Hill, reporter Jonathan E. Kaplan wrote. In letters sent separately by each woman to the House ethics committee, the FBI and the U.S. Attorney's Office, they said Mr. Conyers demanded that aides work on several local and state campaigns and forced them to baby-sit and chauffeur his children. They also charge that some aides illegally used Mr. Conyers' congressional offices to enrich themselves. Put those stones away, Mr. Conyers. The splashback could be a bear. We're fighting the Great War on Terror with perhaps our most potent weapon still wrapped in its sheath. We've got something that would turn the most committed of terrorists into a blob of putty, and we refuse to use it. Of course, it comes from the world of music. It's not Barbra Nose Streisand, even though that would provide some high-quality weaponry. It's not heavy metal. The big hair on these guys would be pretty potent, as would the white noise they create. It's not even emo, the rage amongst the teens, with its confusing screeching at the top of one's lungs with singing. The Chicken Dance is a standby at weddings. If you've been to a wedding in many parts of North America, the odds are decent that the disc jockey or band will have played the Chicken Dance. You've seen how this particular tune turns perfectly normal people into flapping, squawking idiots. You've seen its potency first hand. You may even have participated yourself. Imagine what this would do to terror cells. It would drive 'em wacko. So, generals, forget those small thermonuclear devices. Unleash the Chicken Dance on 'em. The terrorists will pay you to take them away, ha-ha, he-he, ho-ho. Well, the Olympics are over (I'm O.K. with Sweden winning the gold, but I would have preferred Finland because of my Flyer in goal, Antero "Frank" Niittymaki.). Now, it's time for a shortened "silly season" -- the NHL trade deadline is a little more than a week away. But it's gonna be different this year, thanks to two factors. The salary cap. Teams can't just go on a buying spree, because they still have the cap to think about. That really is going to limit the number of big-name moves. The small seller's market. There are only a handful of teams that are clearly out of the Stanley Cup playoff picture right now. There are enough teams on the bubble who may be buyers, not sellers, to make it a very tight market. Still, the rumour mill will churn, as it always does here in Philly, where Trader Bob Clarke hasn't met a deal he wouldn't talk about (but not on the record). With Keith Primeau's announcement Tuesday that he won't be back, the Flyers are in the market for another quality forward, preferably a centreman with some size. Mark Recchi. Yeah, he's not a centreman, but he's a still a consistent scoring threat, which the Flyers could use for 2nd line purposes. He still likes Philly; he's played for coach Ken Hitchcock; his cap numbers probably will work; and Clarke is noted for bringing ex-Flyers back to town. Chances: A real possibility. Keith Tkachuk. The big Blues forward carries too big a price tag ($7 million-plus, according to nhlpa.com). He may go somewhere, but it won't be Philly. Chances: Fuhgeddaboutit. Joe Nieuwendyk. Jokinen's teammate is about 6,500 years old, it seems. And he's had some health problems the last few seasons. But he's still one of the best faceoff men in hockey, he has a history with Hitchcock (a Cup in Dallas), he can still score some, his cap numbers would work, and he wouldn't come quite as expensively as Jokinen would. Chances: Fair to middling. Mike Ricci. Phoenix may look to get younger, which makes the feisty veteran centreman a possibility. He's an ex-Flyer (though a long-ago one -- he was involved in the original Eric Lindros deal), his cap number is under $2 million, and he's still solid defensively. Chances: Fair to middling. Well, by next Friday we'll know. The Supreme Court unanimously ruled yesterday that federal extortion and racketeering laws cannot be used against protesters at abortion clinics, ending a legal battle that has gone on for 20 years. The high court's 8-0 decision effectively bars efforts by pro-choice groups to bankrupt the pro-life movement by using federal anti-mob laws against protest groups, claiming that such organizations were violent criminal conspiracies. But in his 15-page decision for the unanimous court, Justice Stephen G. Breyer ruled that "physical violence unrelated to robbery or extortion," such as demonstrations by abortion opponents at clinics, "falls outside the scope of the Hobbs Act," the federal extortion statute enacted in 1946. "Congress did not intend to create a free-standing physical violence offense ... the Hobbs Act defines 'extortion' as necessarily including the improper 'obtaining of property from another,' " concluded Justice Breyer, who was appointed by President Clinton and usually supports the right to abortion. He noted that pro-lifers demonstrating at abortion clinics "did not obtain property from women seeking to enter clinics to get abortions and so 'did not commit extortion.' " Justice Samuel A. Alito Jr., who was not on the court when the case was argued, was the one justice not to sign the decision. Justice Breyer also held that Congress addressed violence outside abortion clinics by passing another statute, the Freedom of Access to Clinic Entrances Act, in 1994. But Kim Gandy, president of the National Organization for Women, charged that by vacating a nationwide injunction against abortion clinic protesters "on narrow, technical grounds, the Supreme Court sided today with thugs and bullies, not peaceful protesters." Mrs. Gandy held that the injunction "contributed to the dramatic reduction in clinic violence that we have witnessed in recent years." She noted that the 1998 injunction was imposed after a Chicago jury found that clinic demonstrators had engaged in a pattern of racketeering by interfering with clinic operations, damaging clinic property, menacing doctors and assaulting patients. Mrs. Gandy said that if yesterday's ruling "ushers in a return to clinic violence in the United States, NOW stands ready to fight in every jurisdiction." Pro-lifers exulted in the decision. "Naturally, I am gratified to be vindicated once again by the U.S. Supreme Court," Joseph M. Scheidler, national director of the Chicago-based Pro-Life Action League and petitioner in the case -- Scheidler vs. NOW. He said the Supreme Court was "right" in 2003 when it initially lifted a nationwide injunction against clinic protests by pro-life groups. "But NOW refused to acknowledge defeat. They convinced the 7th Circuit Court of Appeals to keep the case alive in spite of the Supreme Court's clear mandate to end it," Mr. Scheidler said. In a telephone interview yesterday, Troy Newman, president of Operation Rescue, called the high court's unanimous decision "incredible, fantastic, awesome and a vindication for all the threats, intimidation and oppression we have endured from the pro-abortion lobby" for two decades. He predicts the ruling will mean an "energizing" of peaceful protests at abortion clinics at a time when momentum is already on their side. For the past two decades, said Mr. Newman, there has been a "quenching of the spirit of pro-lifers," because of their fears "they could be sued, thrown in jail" or bankrupted by heavy fines for violating the Hobbs Act or the Racketeer Influenced and Corrupt Organizations Act (RICO), the federal anti-racketeering law. "Joe [Scheidler] led the charge, and every pro-lifer owes him a huge debt of gratitude," Mr. Newman said. He pointed out that Mr. Scheidler "has sacrificed so much" for the pro-life cause and that his financial losses to pro-choice organizations in RICO cases are in the hundreds of thousands of dollars. A pro-life group called Liberty Counsel said RICO has been used to impose fines of more than $100 million against some abortion protesters. It was an unusual move in 1986, when NOW filed a class-action lawsuit against Operation Rescue, the Pro-Life Action League, Mr. Scheidler and two other league leaders, accusing them of conducting a nationwide conspiracy designed to shut down clinics that perform abortions. What was different was that the suit relied on the 1970 RICO law, which was primarily used in criminal cases against organized crime. In the opinion yesterday, the Supreme Court determined the 7th Circuit was wrong to send the long-running litigation back to the federal judge to consider four other threats or acts of violence at abortion clinics. Those cases were separate from 117 others the Supreme Court considered in 2003. Justice Breyer said the other four cases "fall outside the scope" of the Hobbs Act and RICO. So he sent them back to the appeals court to enter a judgment on behalf of the pro-life groups. Now, we'll see who the real thugs are -- on both sides of the debate.